This article is about the computer company. For other uses, see Next. NeXT, Inc. (later NeXT Computer, Inc. and NeXT Software, Inc.) was an American computer and software company founded in 1985 by Apple Computer co-founder Steve Jobs. Its name was usually pronounced as "Next". Based in Redwood City, California, the company developed and manufactured a series of computer workstations intended for the higher education and business markets. NeXT was founded by Jobs after he was fired from Apple, along with several co-workers. NeXT introduced the first NeXT Computer in 1988, and the smaller NeXTstation in 1990. The NeXT computers experienced relatively limited sales, with estimates of about 50,000 units shipped in total. Nevertheless, their innovative object-oriented NeXTSTEP operating system and development environment ( Interface Builder) were highly influential. NeXT later released much of the NeXTSTEP system as a programming environment standard called OpenStep. NeXT withdrew from the hardware business in 1993 to concentrate on marketing OPENSTEP for Mach, its own OpenStep implementation, for several original equipment manufacturers (OEMs). NeXT also developed WebObjects, one of the first enterprise web application frameworks. WebObjects never became very popular because of its initial high price of $50,000, but it remains a prominent early example of a Web server based on dynamic page generation rather than on static content. While chairman, Jobs visited university departments and faculty members to sell Macintosh. Jobs met Paul Berg, a Nobel Laureate in chemistry, at a luncheon held in Silicon Valley to honor François Mitterrand, then President of France. Berg was frustrated by the expense of teaching students about recombinant DNA from textbooks instead of in wet laboratories, used for the testing and analysis of chemicals, drugs, and other materials or biological matter. Wet labs were prohibitively expensive for lower-level courses and were too complex to be simulated on personal computers of the time. Berg suggested to Jobs to use his influence at Apple to create a " 3M computer" workstation for higher education, featuring at least one megabyte of random-access memory (RAM), a megapixel display and megaFLOPs performance, hence the name "3M". Jobs named his new company Next, Inc. A number of former Apple employees followed him to Next, including Joanna Hoffman, Bud Tribble, George Crow, Rich Page, Susan Barnes, Susan Kare, and Dan'l Lewin. After consulting with major educational buyers from around the country, including a follow-up meeting with Paul Berg, a tentative specification for the workstation was drawn up. It was designed to be powerful enough to run wet lab simulations and cheap enough for college students to use in their dormitory rooms. Before the specifications were finished, however, Apple sued Next for "nefarious schemes" to take advantage of the cofounders' insider information. Jobs remarked, "It is hard to think that a $2 billion company with 4,300-plus people couldn't compete with six people in blue jeans." The suit was eventually dismissed before trial. The original design team had anticipated releasing the computer for US$3,000 in spring of 1987 to be ready for sale by summer of that year. The NeXT Computer received standing ovations when revealed at a lavish, invitation-only gala event, " NeXT Introduction — the Introduction to the NeXT Generation of Computers for Education" at the Louise M. Davies Symphony Hall, San Francisco, California on Wednesday October 12, 1988. The following day, selected educators and software developers were invited (for $100 registration fee) to attend the first public technical overview of the NeXT computer at an event called "The NeXT Day" held at the San Francisco Hilton. This event gave developers interested in developing NeXT software an insight into the software architecture, object-oriented programming and developing for the NeXT Computer. The luncheon speaker was Steve Jobs. The NeXT Computer was based on the new 25 MHz Motorola 68030 central processing unit (CPU). The Motorola 88000 RISC chip was originally considered, but was not available in sufficient quantities. It included between 8 and 64 MB of random-access memory (RAM), a 256 MB magneto-optical (MO) drive, a 40 MB ( swap-only), 330 MB, or 660 MB hard disk drive, 10BASE2 Ethernet, NuBus and a 17-inch MegaPixel grayscale display measuring 1120 by 832 pixels. In 1989 a typical new PC, Macintosh, or Amiga computer included a few megabytes of RAM, a 640×480 16-color or 320x240 4000-color display, a 10 to 20 megabyte hard drive and few networking capabilities. It also was the first computer to ship with a general-purpose DSP chip (Motorola 56001) on the motherboard. This was used to support sophisticated music and sound processing, including the Music Kit software. 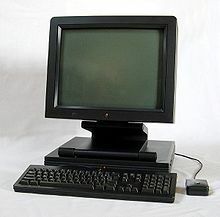 NeXT released a second generation of workstations in 1990. 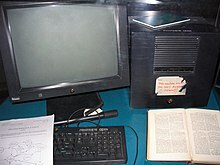 The new range included a revised NeXT Computer, renamed the NeXTcube, and the NeXTstation, nicknamed "the slab," which used a " pizza box" case form-factor. Jobs was explicit in ensuring NeXT staff did not use the latter terminology, lest the NeXT machines be compared to competing Sun workstations. The magneto-optical drive was replaced with a 2.88 MB floppy drive to offer users a way to use their floppy disks. However, individual 2.88 MB floppies were expensive and the technology did not supplant the 1.44 MB floppy. Realizing this, NeXT utilized the CD-ROM drive, which eventually became an industry standard for storage. Color graphics were available on the NeXTstation Color and the NeXTdimension graphics processor hardware for the NeXTcube. The new computers were cheaper and faster than their predecessors, with the new Motorola 68040 processor. In its existence, Next has sold a total of 50,000 copies of Nextstep, says Jobs. It's not much of an installed base, so he predicts the company will ship 50,000 Nextstep packages in 1993. But Next needs to increase its volume three-fold in order to build enough momentum to forestall Microsoft and Taligent in the object-oriented software business. In total, 50,000 NeXT machines were sold,   including thousands to the then super secret National Reconnaissance Office located in Chantilly, Virginia. NeXT's long-term aim was to migrate to the RISC (Reduced Instruction Set Computing) architecture, a processor design strategy intended to increase performance. The project was known as the NeXT RISC Workstation (NRW). Initially the NRW was to be based on the Motorola 88110 processor, but due to a lack of confidence in Motorola's commitment to the 88000-series architecture, it was later redesigned around dual PowerPC 601s. NeXT produced some motherboards and enclosures, but exited the hardware business before full production. Other commercial programs were released for NeXT computers, including Altsys Virtuoso, a vector drawing program with page-layout features which was ported to Mac OS and Microsoft Windows as Aldus FreeHand v4, and the Lotus Improv spreadsheet program. The systems also came with a number of smaller built-in applications, such as the Merriam-Webster Collegiate Dictionary, Oxford Quotations, the complete works of William Shakespeare, and the Digital Librarian search engine to access them. NeXT withdrew from the hardware business in 1993 and the company was renamed NeXT Software Inc; consequently, 300 of the 540 staff employees were laid off. NeXT negotiated to sell the hardware business, including the Fremont factory, to Canon. Canon later pulled out of the deal. Work on the PowerPC machines was stopped, along with all hardware production. CEO of Sun Microsystems Scott McNealy announced plans to invest $10 million in 1993 and use NeXT software (OpenStep) in future Sun systems. NeXT partnered with Sun to create OpenStep which was NeXTSTEP without the Mach-based kernel. After dropping the hardware business, NeXT returned to selling a toolkit to run on other operating systems, in effect returning to the original business plan. New products based on OpenStep were released, including OpenStep Enterprise, a version for Microsoft's Windows NT. The company also launched WebObjects, a platform for building large-scale dynamic web applications. Many large businesses including Dell, Disney, WorldCom, and the BBC used this WebObjects software for a short time. Eventually WebObjects was used solely to power Apple's iTunes Store and most of its corporate Web site,  though it is no longer in use. A server version of the new operating system was released as Mac OS X Server 1.0 in 1999, and the first consumer version, Mac OS X 10.0, in 2001. The OpenStep developer toolkit was renamed Cocoa. Rhapsody's Blue Box was renamed Classic Environment and changed to run applications full-screen without requiring a separate window. Apple included an updated version of the original Macintosh toolbox, called Carbon, that gave existing Mac applications access to the environment without the constraints of Blue Box. Some of NeXTSTEP's interface features were used in Mac OS X, including the Dock, the Services menu, the Finder's " Column" view, and the Cocoa text system. ^ a b c "NeXT Inc. to Drop Hardware 300 losing jobs in strategy shift". San Francisco Chronicle. February 9, 1993. ^ a b c "Apple Computer, Inc. Agrees to Acquire NeXT Software Inc" (Press release). Apple Computer. December 20, 1996. Archived from the original on February 8, 2002. Retrieved June 13, 2008. ^ "Apple Computer, Inc. Finalizes Acquisition of NeXT Software Inc" (Press release). Apple Computer. February 7, 1997. Archived from the original on January 17, 1999. Retrieved June 13, 2008. ^ Stross, Randall (1993). Steve Jobs and the NeXT Big Thing. Athenium. pp. 56, 67. ISBN 0-689-12135-0. ^ Morrison, Jas (February 20, 1984). "NeXT, Microsoft tackle objects: NT to gain OpenStep port". Fortune. ^ Shannon, Victoria (May 22, 2006). "Apple losing its polish in Franc". International Herald Tribune. p. 11. Archived from the original on June 2, 2006. ^ Fuerst, Irene (March 15, 1985). "Apple's new Mac push; can Apple Computer succeed in wooing big companies with its Macintosh Office?". Datamation. p. 42. ^ Stross, Randall (1993). Steve Jobs and the NeXT Big Thing. Athenium. p. 75. ISBN 0-689-12135-0. ^ a b c Stross, Randall (1993). Steve Jobs and the NeXT Big Thing. Athenium. ISBN 0-689-12135-0. ^ "NeXT logo by Paul Rand". Logo Design Love. March 29, 2010. Retrieved February 10, 2019. ^ Menuez, Doug (June 3, 2014). Fearless Genius: The Digital Revolution in Silicon Valley 1985-2000. Official website. Atria Books. ISBN 978-1476752693. OCLC 852226582. Retrieved February 10, 2019. ^ a b Thompson, Tom; Baran, Nick (November 1988). "The NeXT Computer". Byte. 13 (12): 158–175. ^ Bonnera, Paul (February 1989). "The heart of a new machine (frogdesign for NeXT computer)hi". PC/Computing Magazine. p. 144. ^ "Steve Jobs building NeXT". ^ White, David W. (December 1989). "Dell System 325 (Hardware Review)". The Local Area Network Magazine. p. 132. ^ Krasnoff, Barbara (December 1989). "Buyer's guide: benchmarks". Personal Computing. p. 170. ^ a b c d Rawles, Richard (September 19, 1989). "Developers split over optical drive (NeXT Inc's 256Mbyte erasable magneto-optical drive)". MacWEEK. p. 3.n33. ^ "Businessland Deal Seen for Next Inc". The New York Times. Reuters. March 25, 1989. ^ Shaffer, Richard (July 1989). "NeXT means business now". Personal Computing. General Reference Center Gold. ^ McCarthy, Vance (July 17, 1993). "Steve Jobs just says no". Fortune. General Reference Center Gold. ^ Ford, Kevin. "Canon object.station 41". The Best of NeXT Computers. Archived from the original on January 14, 2012. Retrieved September 18, 2011. ^ Garfinkel, Simon L (April 1994). "Open Door Policy". NeXTWORLD. ^ "NeXT may expand two-man board". PC Week. December 9, 1991. p. 125. ^ a b c "Steve's Gone Soft". UnixWorld. McGraw-Hill: 44. April 1993. ^ "NeXT Fans Give Up the Ghost". Wired. December 21, 2005. Archived from the original on June 29, 2011. Retrieved March 3, 2011. ^ Garfinkel, Simson L. (March 1993). "Hardware was great while it lasted". NeXTWORLD. Retrieved June 13, 2008. ^ Lavin, Dan (March 1993). "Canon to buy NeXT factory, design center". NeXTWORLD. Retrieved June 13, 2008. ^ "Mathematica — Celebrating 25 Years of Contributions, Invention, Discovery, and Education: Nov. 1987: Steve Jobs signs on to bundle Mathematica with every NeXT computer..." mathematica25.com. Archived from the original on November 25, 2013. ^ Berners-Lee, Tim. "The WorldWideWeb browser". World Wide Web Consortium. Retrieved June 13, 2008. ^ "Inventing the Web". Computer History Museum. Retrieved August 25, 2016. The expensive but cutting-edge NeXT computer […] was famous for rapid prototyping features. These let Tim Berners-Lee create the Web in just three months, but restricted the first browser-editor to these rare machines. ^ John Romero (December 20, 2006). "Apple-NeXT Merger Birthday!". Archived from the original on March 5, 2007. ^ "Next Computer Close To a Deal With Chrysler". San Francisco Chronicle. September 8, 1992. ^ Sherman, Lee (2004). "First NeXT RISC Workstation". NeXTWORLD. Retrieved April 14, 2008. ^ "NeXTSTEP: NeXT announces new release of NeXTSTEP & NeXTSTEP Developer. (NeXTSTEP 3.2 and NeXTSTEP Developer 3.2)". EDGE: Work-Group Computing Report. October 25, 1993. p. 40. ^ McCarthy, Shawn P. (March 6, 1995). "Next's OS finally is maturing. (NextStep Unix operating system)". Government Computer News. p. 46. ^ Beard, Mat (June 1994). "Elonex NextStation". Personal Computer World. ^ Bidmead, Chris (February 1995). "NeXT, please". Personal Computer World. ^ "Sun invests in Next, which will license NextStep OS for Sparc". InfoWorld. General Reference Center Gold. November 29, 1993. ^ Evans, Johnny (June 16, 2005). "Apple releases WebObjects as a free application". MacCentral. Retrieved April 14, 2008. ^ Dalrymple, Jim (June 2, 2003). "Xserves power iTunes Music Store, 'America 24/7'". Macworld. Retrieved October 18, 2017. ^ Tevanian, Avie (April 17, 2017). "Oral History of Avadis Tevanian, part 2" (PDF) (Interview). Interviewed by John Markoff; Hansen Hsu; David C. Brock. Mountain View, CA: Computer History Museum. Retrieved February 10, 2019. ^ Singh, Amit (February 2004). "Quest for the Operating System". kernelthread.com. Retrieved July 23, 2009. ^ Davis, Jim; Kanellos, Michael (January 5, 2000). "Jobs takes Apple CEO job full time". CNET. Retrieved January 4, 2007. ^ Britton, Arlen (August 6, 1997). "What's NeXT?". MacObserver. Retrieved June 13, 2008. ^ Thompson, Tom (April 1997). "Rhapsody with blue (Apple's next-generation operating system code-named Rhapsody)". Byte. p. 26. ^ Sellers, Dennis (November 2000). "OS X III: finally, a first-class OS". Computer User. p. 66. ^ "Apple to Use Intel Microprocessors Beginning in 2006" (Press release). Apple Computer. June 6, 2005. Retrieved June 13, 2008. ^ Stross, Randall E (1993). Steve Jobs and the NeXT Big Thing. Maxwell Macmillan International. pp. 289–374. ISBN 978-0-689-12135-7. ^ "The NeXT big thing: OncoMed finds a home". American City Business Journals. October 28, 2007. Retrieved June 11, 2013. ^ "Serial Archive Listings for NeXTWORLD". The Online Books Page. Retrieved June 13, 2008. ^ Smith, Carrie (May 1994). "NeXT means business now". Wall Street & Technology. General Reference Center Gold. ^ Smith, Carrie (November 7, 1994). "NeXT, Microsoft tackle objects: NT to gain OpenStep port". PC Week. General Reference Center Gold. ^ Tribble, Bud (February 1994). "Bud Tribble Explains It All". NeXTWORLD (Interview). Interviewed by NeXTWORLD. p. 23-24. Retrieved February 10, 2019. ^ Semich, J. William (March 15, 1994). "Taligent (Apple, IBM and HP's joint object-oriented operating system)". Datamation. p. 34. ^ Abate, Tom (June 6, 1995). "Analysts wary of late software by Taligent". SF Gate. Retrieved February 10, 2019. ^ a b Stewart, Graham (2006). "Happy Birthday: WebObjects at 10". MacObserver. Retrieved June 13, 2008. "www.next.com (web archive)". Archived from the original on April 12, 1997. "Archived announcement of NeXT's acquisition by Apple". Archived from the original on April 12, 1997.